Selene (Beckinsale), a beautiful vampire warrior, is entrenched in a war between the vampire and werewolf races. Although she is aligned with the vampires, she falls in love with Michael (Speedman), a werewolf who longs for the war to end. $21.753 million on 2915 screens. Here’s how I’ll bet its creators pitched 2003’s Underworld to studio execs: “It’s The Matrix with vampires!” But that simplifies things, for Underworld isn’t really just The Matrix with vampires. 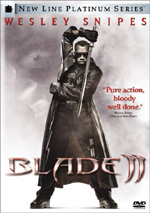 At its heart, it’s The Matrix with vampires... and werewolves. Actually, that doesn’t sound like a bad idea. Unfortunately, the movie itself doesn’t live up to the concept and turns into a fairly dull experience. At the start of Underworld, we learn of an ancient blood feud between vampires and Lycans, creatures we refer to as werewolves. Unlike the movie werewolves we know, some old and powerful Lycans can change form at will. Vampires called Death Dealers try to kill off the Lycans. Something called the Awakening will occur in a few days. Apparently there are three main vampire leaders; they alternate the head spot for a century at a time while the other two snooze. The Awakening brings back the one whose turn it becomes. Death Dealer Selene (Kate Beckinsale) warns the others that the Lycans have something big in the works and this may be timed to coincide with the Awakening. Kraven (Shane Brolly) remains in charge until the Awakening, and he and Selene don’t seem to get along; she doesn’t think he’s much of a leader, and he mostly ignores her theories. Selene believes the Lycans tried to follow and capture a human named Michael Corvin (Scott Speedman), but again, Kraven discounts his ideas. Against his wishes, she finds and nabs him, but he escapes after too long. Slowly the plot emerges that relates why the Lycans want Corvin, and we also discover some underhanded dealings that connect to the apparently-long-dead Lycan leader Lucian (Michael Sheen). I wish I could say that all of this plot really existed as an excuse for some fine vampire vs. werewolf action, but unfortunately, those moments never really emerge. Oh, we do get battles between the two groups, but they seem almost superfluous. They come across like the filmmakers added them because they felt they had to do so, not because they wanted to do so. Underworld remains much more concerned with its story about politics and deception than with action. And that’s its greatest shortcoming, as the thing simply seems dull much of the time. It starts out with a decent bang; though its obvious thievery from The Matrix detracts from the opening battle, it still gets us into the mood and allows us to anticipate fights yet to come. Unfortunately, those never really develop. Some action occurs but the efforts feel half-hearted and never manage to involve us and get pulses racing. That seems like a disappointment, for the idea behind Underworld really is a good one. As “high concept” as it may be, that doesn’t mean it can’t be fun. Sadly, fun is in short supply during this film, and it just comes across as bland and plodding. The story itself suffers from some problems. The backstory behind the Lycan/vampire war seems intriguing, but the movie concentrates so much on the hunt for Corvin that we don’t learn much about this. Enough emerges to set up the characters and their motivations, but the film appears more interested in Corvin and Selene and a theoretical romance between them. None of this goes anywhere. Beckinsale and Speedman look good, but they enjoy no chemistry in their moments together. None of the actors really brings a whole lot to their roles, actually. They seem competent but no one breaks out of the pack to add some spark to the dull proceedings. The film’s ending clearly sets up a sequel, which seems like a positive and a negative. While I didn’t like Underworld and wouldn’t want to see a sequel that resembles it, the underlying concept behind the flick remains cool enough that I’d be interested in additional explorations. Unfortunately, the one at hand fails to muster much of interest, and it comes as a definite disappointment. 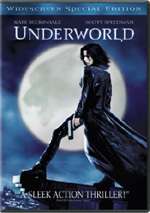 Underworld appears in an aspect ratio of approximately 2.35:1 on this single-sided, double-layered DVD; the image has been enhanced for 16X9 televisions. For the most part, Underworld presented a strong picture. Sharpness seemed immaculate. I never noticed any signs of softness or fuzziness. Instead, the movie looked nicely crisp and detailed at all times. Jagged edges and moiré effects created no concerns, and only a smidgen of edge enhancement seemed apparent on rare occasions. I noticed no signs of print flaws, as the image looked clean. With the various supplements packed onto the disc, I worried that it’d look noisy due to compression issues, but other than some light grain – to be expected via the movie’s many low-light shots – I saw no elements that resembled those concerns. Underworld presented such a flat palette that it virtually came across as a black and white film. Even shots of blood appeared quite muted, as the vast majority of the film came across in varying levels of blue and dark tones. A little green showed up at times – ala Matrix - but even that stayed modest. Some mild reds appeared as well, but they didn’t show up with much frequency. Blues and blacks ruled the day, and all the tones looked accurately reproduced within their limitations. As for the dark elements, they were deep and dense. I thought blacks seemed nicely replicated and presented clear, taut textures. Low-light shots came across extremely well. They looked very well-defined and delineated and made the movie quite attractive. Despite its stylistic limitations, Underworld presented a fine transfer. While the Dolby Digital 5.1 soundtrack of Underworld scored points for ambition, it lost some due to execution. To be sure, the soundfield seemed terrific. The movie presented a wide and broad spectrum that presented a strong feeling of environment. The mix utilized all five channels in a very active and involving way. Vampires and Lycans moved all around the soundscape cleanly and in a lively manner, and other violent elements popped up in various appropriate places. These meshed together well and created a vivid and enveloping sense of place. For the most part, audio quality seemed good, with one exception: bass response. Ala The Lord of the Rings: The Fellowship of the Ring, this mix sounded way too hot. Every little sound came with an enormous boom. Gunshots displayed excessive bass, and the over-the-top low-end even affected small elements like the closing of car doors. Anything that theoretically could produce a thump displayed a loud rumble. Even the idling of a car engine sounded like the world was coming to an end. This became a distraction and caused me to lower my audio grade. Otherwise, the audio sounded strong. Dialogue was natural and well-defined, and I noticed no issues connected to intelligibility or edginess. Music seemed smooth and vibrant, with clean highs and manageable low-end; the excessive bass didn’t appear to affect the score, happily. Effects were solid except for the low-end issues I already mentioned. They otherwise came across as clean and accurate and suffered from no signs of distortion or other problems. Without the bass issues, I’d have given the audio of Underworld an “A”; it offered a generally excellent mix. However, the low-end was so overwhelming that I knocked down my mark to a “B+”. Although it didn’t fare tremendously well at the box office, Underworld comes with a decent roster of supplements. We start with two separate audio commentaries. The first features director Len Wiseman, writer Danny McBride, and writer/actor Kevin Grevioux, all of whom sit together for their running, screen-specific chat. They get into topics like differences between the original script and the final film, the risks they took to pursue the project, training of actors and working with them, and sets and locations. The three enjoy a nice chemistry and comfort level and interact well. The commentary goes over a mix of useful subjects and seems like a fairly compelling and intriguing piece. For the second commentary, we get notes from creature designer Patrick Tatopoulos, visual effects supervisor/executive producer James McQuaide, and sound designer Claude Letessier. All three sit together for their running, screen-specific chat. This track seems informative but somewhat bland. The three men cover the appropriate material in a reasonably efficient manner, and they get into some fun details about their work. For example, Letessier relates some of the techniques he used to simulate various sounds. Unfortunately, they often just praise different participants and aspects of the production, and they go quiet a little too often. This isn’t a bad commentary, but it seems fairly flat. In the “Featurettes” area we find four separate clips. The Making of Underworld runs 13 minutes and one second as it combines movie snippets, a few shots from the set, and interviews. We hear from Wiseman, Grevioux, McBride, producers Richard Wright and Gary Lucchesi, assistant stunt coordinator Scott McElroy, stunt coordinator Brad Martin, creature effects supervisor Guy Himber, and actors Kate Beckinsale, Bill Nighy, Scott Speedman, Shane Brolly, Erwin Leder, Sophia Myles, and Michael Sheen. Mostly they cover the story of the film, but we also get a little information about the devices used to create the on-set creatures and some stunts. Those moments are fine, but they don’t fill enough of the piece, as it mainly just shows movie clips and touts the film. It’s a mediocre program, and since all of the decent info appears in subsequent featurettes, it becomes pretty useless. Next we get a look at Creature Effects. This 12-minute and 28-second featurette includes the same mix of film snippets, behind the scenes footage, and interviews. We get notes from Tatopoulos, Wiseman, McBride, Himber, Nighy, creature effects art director Steve Wang, and lab technician supervisor Gabe Bartalos. They discuss the design and creation of the Lycans plus a little about Viktor’s visual elements. It’s a concise and informative program. In the 11-minute and 41-second Stunts, we find comments from Wiseman, Martin, Beckinsale, McElroy, Wright, McBride, Sheen, Nighy and Speedman. They cover training for the actors, design of wirework, and various other stunt-related issues. “Stunts” seems clear and interesting, and it stands out as particularly good due to the fun shots of rehearsals and training. Finally, Sights and Sounds runs nine minutes and six seconds and presents a montage of material from the set. We see video footage of random behind the scenes shots. These don’t seem terrific, and it occasionally resembles a long gag reel. Still, it gives us a moderately interesting and enjoyable glimpse at the production. After this we find a music video for “Worms of the Earth” by Finch. They offer a lip-synch performance of the tune and we see many movie clips in this dull video. The storyboard comparison presents a split-screen examination of the movie’s opening sequence and four other scenes. It runs six minutes, 41 seconds and offers a decent look at the material. Finally, we get two TV spots and a collection of trailers. These appear for Underworld, The Forsaken, John Carpenter’s Vampires, John Carpenter Presents Vampires: Los Muertos, Resident Evil, and Resident Evil 2: Apocalypse. Underworld enjoys a terrific concept behind it, but unfortunately, it largely squanders its potential. The movie looks good but presents very little excitement or real intrigue. The DVD offers strong picture quality plus generally solid audio marred only by some excessive bass. The extras seem pretty positive as well and add some value to the package. Unfortunately, the movie itself remains a moderate dud, so I find it tough to recommend the package.